New to the scratch map concept? Where have you been? Jet-setting off on your travels? In that case the Scratch Map is the perfect gift: a personalised double layered map that allows you to scratch off the countries you have visited and display for all to see. 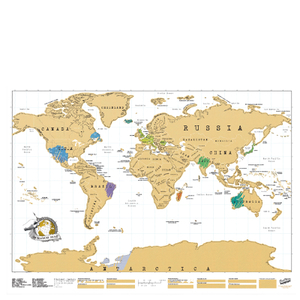 The hugely popular Scratch Map now comes in an XL Edition: an extra-large world map printed on high quality gloss finish paper with gold foil overlay. Use a coin to scratch of countries you have visited and plan future travels and adventures. The Scratch Map XL Edition is the perfect gift for anyone who has a love of travelling. a gift bought for my partner who likes traveling a lot, he likes it a lot. Very good quality! So pleased with this map I bought it for a gift! It looks great and will look even better when framed. It's a lot bigger than I expected but there weren't any measurements on the listing. Never the less it's a brill gift for any travel lover!